This easy to make pizza always seems to impress and is enjoyed by most vegetarians and carnivores alike. The sweet licorice and onion flavour is a nice compliment to the tart goat cheese and salty black olives. Great for an appetizer, meal or after the bar when you want to munch on something sweet and savoury. I always buy the crust/flat bread because every time I attempt to make pizza dough it turns out to be the size of a soccer ball. 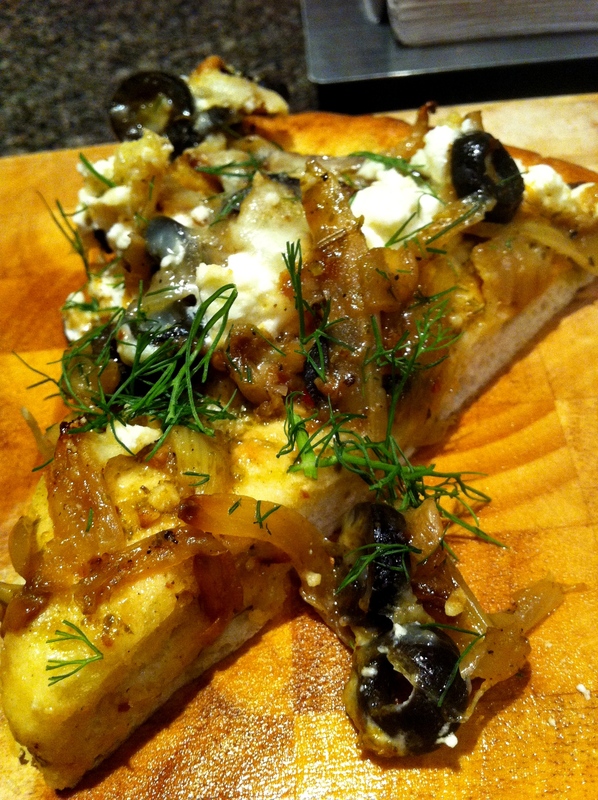 Spread on the fennel/onion, then crumble the goat cheese and dot the za with sliced black olives. Quantity of ingredients depends on your tastes. I usually save the fronds from the fennel and sprinkle some on the pizza after it’s cooked. Looks great. Would be awesome paired with our white Cotes du Rhone –or, of course, a Loire Valley wine.